“If agricultural wastewater went straight to the wastewater treatment plant, the facility would just collapse,” says Dr. Isam Sabbah, left, founder of the clean tech company Agrobics. Growing up in the Galilee region of Israel, Dr. Isam Sabbah was all too aware of the problems associated with the waste from olive presses. He’d seen organic wastes and oils flowing into the streets and through the valleys nearby his home. As a student of environmental science at the Technion Israel Institute of Technology in the northern city of Haifa, he learned just how polluting the agriculture industry can be to groundwater. It became his goal to make the industry more environmentally friendly. 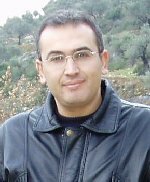 With a PhD in environmental sciences in hand, about seven years ago the Galilee Society (the Arab National Society for Health Research and Services that strives to achieve equitable health, environmental and socio-economic conditions for Palestinian Arabs in Israel) charged Sabbah with a research project to investigate ways of safely dealing with olive oil waste, pulp and oils. New solutions are needed, Sabbah tells ISRAEL21c: “If agricultural wastewater went straight to the wastewater treatment plant, the facility would just collapse.” In his search for ways to increase the effectiveness of biological reactors that digest organic materials in wastewater, Sabbah developed an idea for a system that could be a standalone or add-on to treat agricultural wastewater. Then in 2009, he created Agrobics, a startup clean technology company developed to handle wastewater with high organic loading rates. The company of four received a grant from the Office of the Chief Scientist and today it’s based in Shefa-Amr, an Arab town in Israel’s north. Sabbah explains the problems of the agriculture business: Even with good intentions, the most “organic” of farms produces waste – of the organic variety. Whether it’s a citrus fruit facility, olive press, or meat packing plant, any producer in the agro-industry must be mindful of plant and animal waste that’s flushed down the drain. With organic loads 200 times those found in regular wastewater, the liquid waste from the agricultural industry can’t be flushed down the drain. It would overload the system, causing it to break down. And polluters looking to bypass the law know that fines can be steep. As a result companies and farms either buy in-house equipment to digest the waste, or purchase the services of a company to come and collect it, at a cost of thousands of dollars per month. With pilot sites in place in Israel at an olive oil factory and boutique cheese farm, Agrobics offers a cost-effective solution that is more flexible, attuning itself to the fluctuations that can occur in biological waste digesters, so that fewer costly breakdowns result. According to Sabbah, for some effluents like olive mill wastewater there are no satisfactory solutions on the market. Meanwhile, for other effluents the process remains slow, costly and not altogether effective. For a smaller unit, suited to a boutique cheese farm, the cost would be about $75,000 for the turnkey solution. Seeking a $1.5 million investment to take Agrobics to the semi-industrial scale, Sabbah expects to be ready commercially in about a year and a half if investment goals are met. In the interim, he is negotiating with an Israeli biogas equipment company to fit biogas collectors and burners onto Agrobic’s digesters that break down organic waste. This is accomplished in an anaerobic system (without air) using a cocktail of bacteria, which, when they’re done eating their lunch, emit methane gas. Methane gas (CH4) is a damaging greenhouse gas but one that can be burned and used for energy. The Agrobics solution, if it comes to market, could reduce pollution on many levels.